Put beef in slow cooker. Add broth, soy sauce and onion soup mix. Cook on low 6-8 hours. Crumble meat. Place cheese on hoagie buns and cover with meat. Serve with remaining juice. This sounds amazing...I have a roast thawing and was trying to figure out what I could do with it tomorrow...!!! Excellent timing! I never thought of making these myself. I have a roast that I am putting in tonight. I think it would be a great surprise if i did this instead. Sounds good, thanks for the recipe. This is my kind of recipe!!! I want to try this soon!! 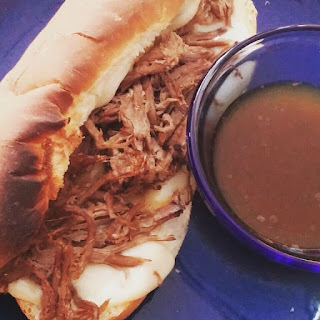 I love a great French Dip sandwich. It's been eons since I had one. Your recipe looks great! I think this sounds great and I am going to make it! I have made this before and it's a wonderful meal. This is an absolutely great Rump Roast recipe. I can't wait to make it. I hope I do as good as your photos. I go out and buy these. Now I can Make them. This looks yummy. I love French Dip Sandwiches. French Dip sandwhiches are my favorite. I've made this before and it's delicious! These sandwiches sound delicious, definitely going to try this recipe.